The Route: Pick up the NYC Ferry from Wall Street Pier 11, we'd suggest sitting on the top deck so that salty air fills your pores and prepares your skin for a day of tropical fun. Bring your bikes on board the ferry for just $1, there is even surfboard storage on the ferry! From the NYC Ferry Landing jump on the free shuttle bus or take a short walk up to Shorefront Parkway (Boardwalk) and hang a left towards Beach 106th Street to visit Caracas Arepa Bar on the boardwalk. This concession is home of some of the greatest Venezuelan food, music and vibes. Their arepas are extremely satisfying at any time of the day, their famous Micheladas are the perfect balance of sweet and spicy and their Frozen Sangria's are a favorite amongst locals. 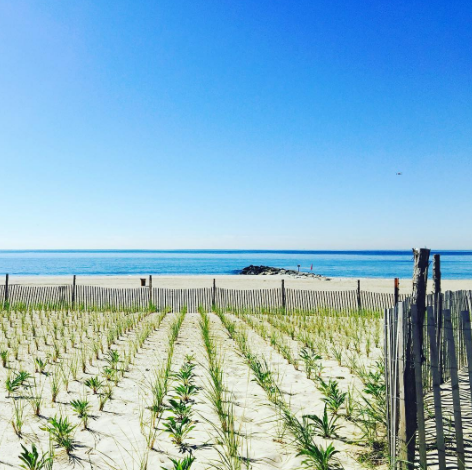 Plant yourself in the sand somewhere between Beach 106th Street and Beach 97th Street. Enjoy the summer sun and refreshing waves of the Atlantic Ocean. Check out this Spotify Playlist that can transport you to the tropics. Relax, you are at the beach. After soaking in the sun for a few hours, head up to the 97th Street Concession and grab a snack from one of these spots offering up some tropical vibes ; Ceviche from La Cevicheria, a Smoothie from La Fruiteria, Nachos from Super Burrito a Popsicle from CitySticks or a Colombian style arepa from Palenque. If you have it in you to take the ultimate bike ride down the boardwalk, head down to Beach 17th street and pay a visit to DredSurfer Grill, a Caribbean-American bar and grill with tons of tropical vibes. The day isn't quite over yet, ride back towards beach 97th Street to return your bike but don't forget to stop at either Connolly's to get brain freeze from one of their frozen Pińa Coladas or Bungalow Bar for one of their frozen summer cocktails- the Pineapple Express is served in a whole pineapple and is sure to give you a little buzz. Around the corner from Connolly's is Beach Bistro 96 which serves up delicious Brazilian bites and plays host to authentic Brazilian entrainment. If Rockaway grabs a hold of you and need a place to crash check out these Air BNB listings.